Nursery school children have been encouraged to draw pictures of the Grenfell Tower fire to "help them understand the world". 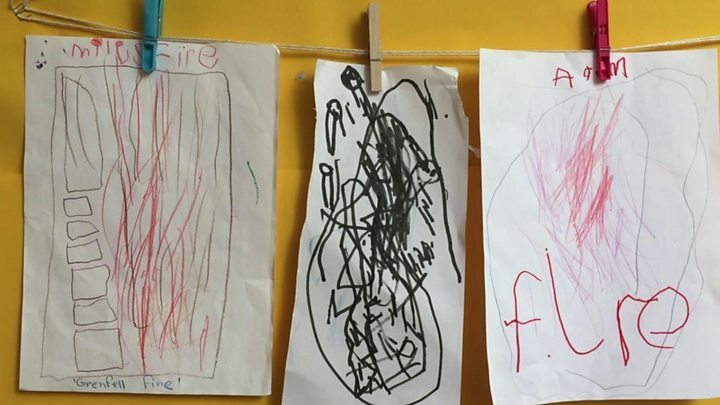 The three and four-year-olds' artwork, created at Caversham Nursery in Reading, depict flames and the people affected by the burning building. Head teacher Lisa Bedlow said pupils had started a discussion about the disaster and that staff had not wanted to ignore their concerns. She said parents had not objected. At least 80 people died as a result of the fire in Kensington, London, and Ms Bedlow said some of the nursery's children had seen distressing images of it in the news at home. She said this led to an unplanned "in the moment" discussion with the children about the disaster. "It is really important for this next generation of children to feel they can be open and honest and share their concerns and worries," said Ms Bedlow. She added that understanding the tragedy helped the children learn and "move on" from negative emotions. "If you don't discuss it, then it's sitting in their head," she said. "They're mulling it over and they are questioning 'how am I going to know about this', or 'I'm not sure' and that's when it could potentially become a mental health issue in later years." Lead teacher Kate Wiggins said the nursery had been "mindful that you don't want to scare [the children]." "They have questions and we answer the questions and use it to explain safety and use it to make links with their learning," she added. Parent Michelle Bull said it was "important" young children learned about events like the Grenfell Tower disaster. She said her son, four-year-old Alex, had heard about it on the radio as they travelled to nursery and talking about it with teachers had helped. "The picture he drew showed that he had understood what had happened," she said.